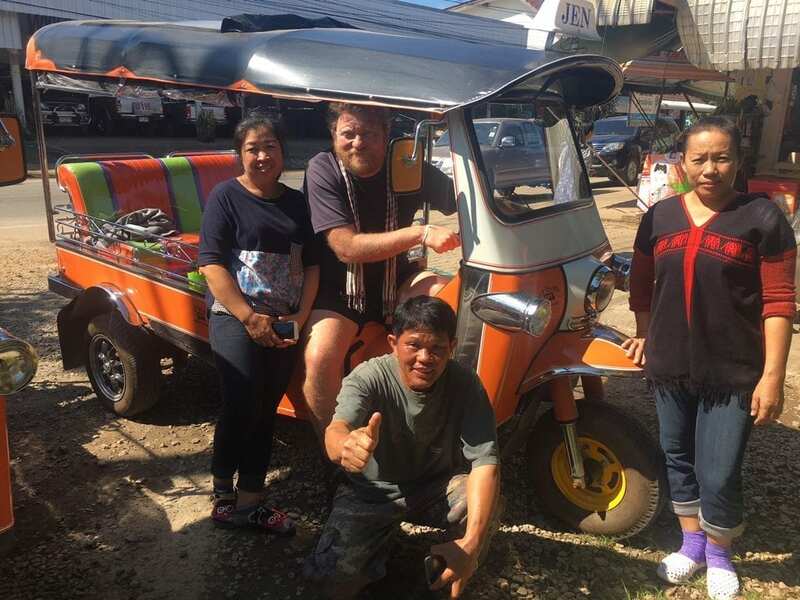 Travel Begins at 40 founder Mark Bibby Jackson has taken up the challenge to drive a tuk tuk through Northern Thailand, you can follow his adventure here. My trip starts with a pick up at the elegant Anantara Chiang Mai, where – fearing the worst – the previous evening I had treated myself to a Thai massage. In eleven days’ time my body bruised from bobbing around in a tuk tuk I suspect I will need more than a pair of skilled hands to soothe my aching bones. Organized by The Tuk Tuk Club the tour had sounded like a good idea a few days ago; a chance to see a part of Thailand I had only experienced in a bus previously. I would spend a few days drifting through the mountain roads in the back of a tuk tuk, occasionally taking the wheel for appearance sake – after all I have a reputation to preserve as an adventurous traveller, at least with my friends who know me least. 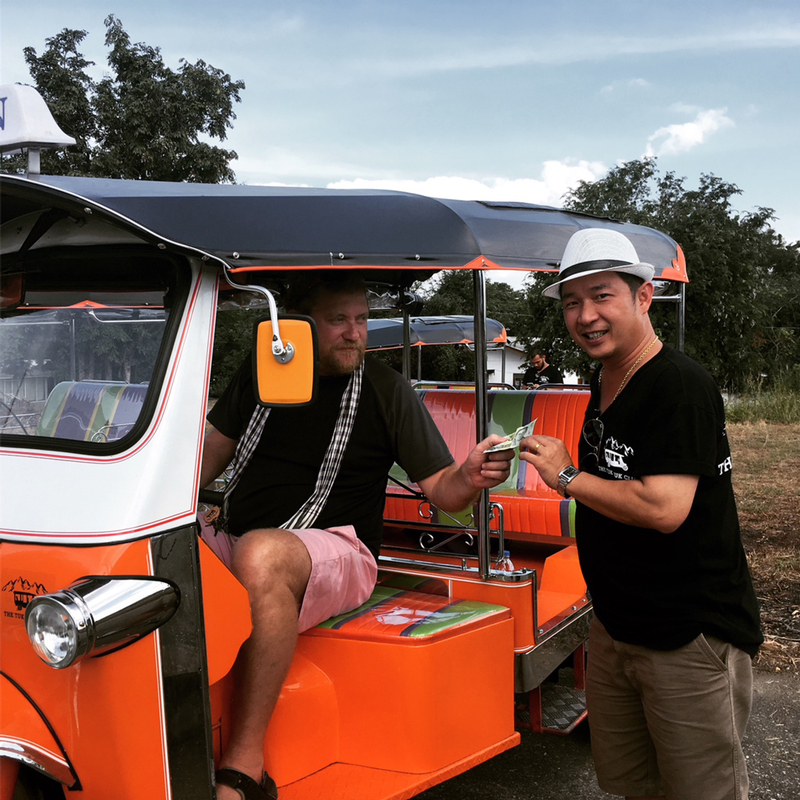 Bruce Haxton, the managing director of the Tuk Tuk Club, had kindly offered me a few days on the tour before a planned trip to Myanmar. However, once the latter failed to materialise Bruce kindly offered to extend the trip to 11 days – what could I do but accept. Perhaps the experience would provide the means to a new career should the travel writing business take a turn for the worst. Taking bad turns was the least of my concerns as I tried to get my trusty steed to lurch forwards in the training ground at Mae Wang village, an hour’s drive from Chiang Mai. When our instructor and tour guide Smithy demonstrated what we had to do, it had all seemed so easy – but appearances can prove deceptive. I turned the ignition key one more time and tried to release the clutch slowly only to hear the now familiar sound of the engine cutting out. Earlier I had managed to get Jen – the name of my tuk tuk (after Bruce’s mum) – to stutter forwards with the grace of a kangaroo that has consumed a few too many beers. 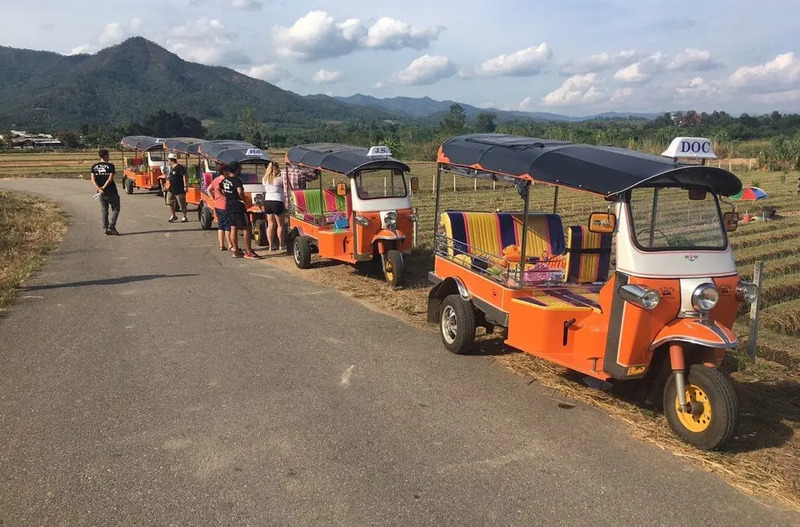 “Maybe, you can try reverse,” Smithy suggested, as my badly positioned tuk tuk was clearly in the way of the other trainees. With little faith I turned the ignition again and released the clutch, only for the vehicle to ease its way slowly backwards, like I was Tony Curtis steering the motor boat in Some Like It Hot. Clearly, I had found my metier – reverse driving a tuk tuk. After all, nobody is perfect. “Maybe I can drive backwards on the tour,” I suggested to Smithy. “That would take 30 days,” he said a broad smile across his face. Eventually, somehow I managed to master the skill of moving forwards as well, even making it up to third gear as I drove around the pitch that used to be a basketball pitch, and which a family of Karen farmers were drying some rice – perhaps sensing some timely compensation for erratic driving. After passing my test – with special commendation for my reversing skills – I graduated to the road. With little mishap we took to the highway in convoy and up to nearby Wat Tham Nam Hoo where a monk held a short ceremony to bless our journey. Like the tuk tuk drivers of Bangkok I was now placing my faith in Buddha – I just hope our prayers were listened to. As we were eating dinner back at our hotel at the end of Day Two, Bruce asked us all what was had been the highlight. 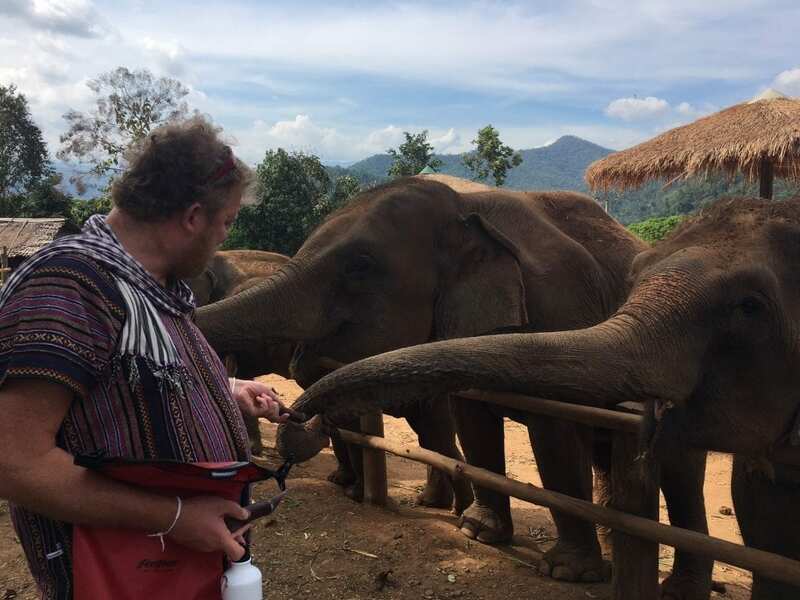 My three companions didn’t skip a beat – a family from Suffolk – the elephants. I hesitated briefly. “Changing gears without Jen jumping forwards, for the first time,” I said honestly. We’d spent the morning driving around the back roads around Mae Wang, as much to keep us out of the way of other vehicles as to enjoy the typical Thai rolling scenery. Today was still a learning day. The fields were full of farmers busy planting spring onions. As we passed them in our convoy of bright orange tuk tuks they waved back at us. It’s a long time since I first came to the Land of Smiles, and with each returning year the epithet seems less appropriate – at least in Bangkok. But here in the countryside the friendliness remains, although I suspect they were shouting out “farang ba” (crazy foreigner) as we passed them. I had started the day by stalling Jen. 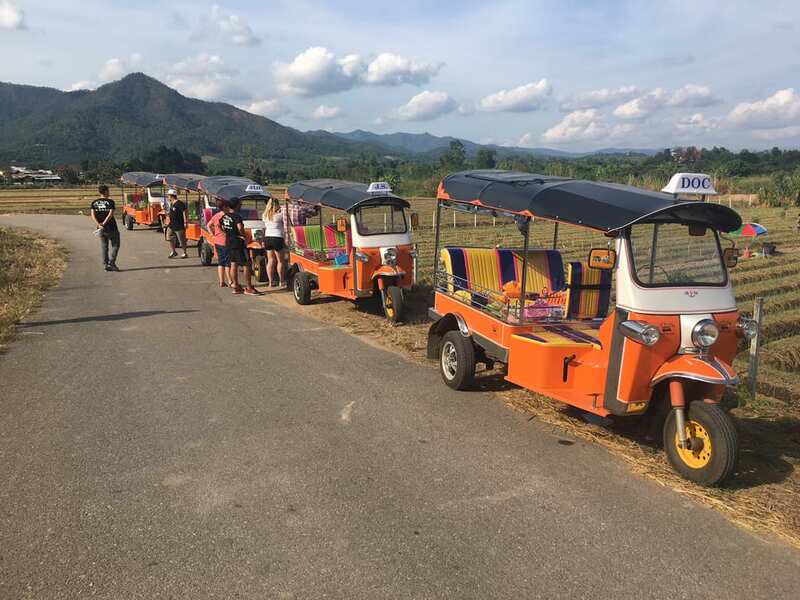 As the other tuk tuks drove off into the horizon I looked non-plussed at my stationery tuk tuk, only to realise I had forgotten to release the handbrake – this was to be a recurring pattern each time I stopped during the day – apparently I fail to learn from errors past. Smith who had drawn the short straw of sitting behind me on the drive suggested maybe we should write “handbrake” on the windscreen. A few moments later I stuttered forwards and we caught up with the rest of our fleet who were waiting for me just around the bend. What then followed can only be described as proof that man – or at least this man – is no match for the chimpanzee intellectually. Smith demonstrated a patience that would have impressed both Buddha and Job as I shifted through the gears with the deftness of a heavyweight boxer performing Swan Lake. Eventually, he suggested I release the clutch more gradually and apply some acceleration at the same time. I did as instructed, and for the first time in the two days, managed to move from second to third without suffering from minor whiplash. From their it was all plain sailing. Or rather winding driving around the pleasant country roads. I even had time to wave at some of the farmers, and focus on giving space for the other road users who understandably wanted to pass our convoy. Around midday we arrived at Maevang Elephant Home where we had lunch before visiting the nine elephants who live here. Currently the ethics of using elephants in the Thai tourism industry is the subject of much heated debate. Up to 18 months ago, Maevang was very much like many other places around Chiang Mai providing elephant rides. However, now tourists come to feed the elephants and then walk beside them to the river where they have their bath – the elephants not the tourists – although everyone ends up in the water. “Here you can feel they are like a friend; you can touch and feed them,” explains Num, who works at Maevang. Seeing him here came as a bit of a surprise as the previous day he had helped me learn to drive a tuk tuk, after serving us lunch at the hotel. 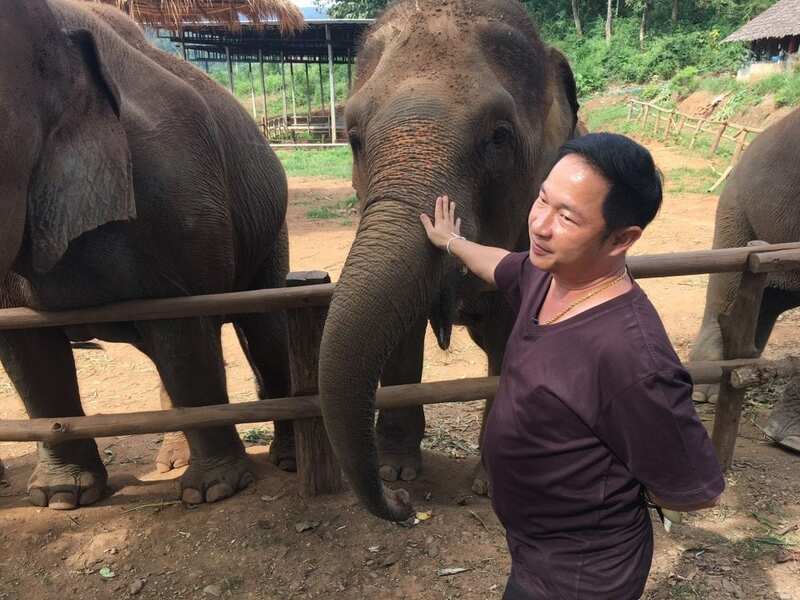 Later Num would explain that the V in Maevang – as opposed to Mae Wang the name of the river and town – is no typo but stands for “victory” in their campaign to improve the lives of elephants. Having fed the elephants, who fortunately had a far greater appetite for water melon and sugar cane than for cellphones and selfie sticks, we walked in a troupe down to the river. There was a childlike quality to the elephants’ play in the water. One of the smaller ones tried to duck his younger sibling’s head under the water, just like any ‘normal’ child would in a swimming pool; only this time mum stood by imperviously as she shot a jet of water at us, rather than yelling at her children to behave. Clearly, they were having fun – something that is not often said of their cousins who trudge their way through the forest carrying gap-year travellers or selfie trigger-happy tourists on their backs. 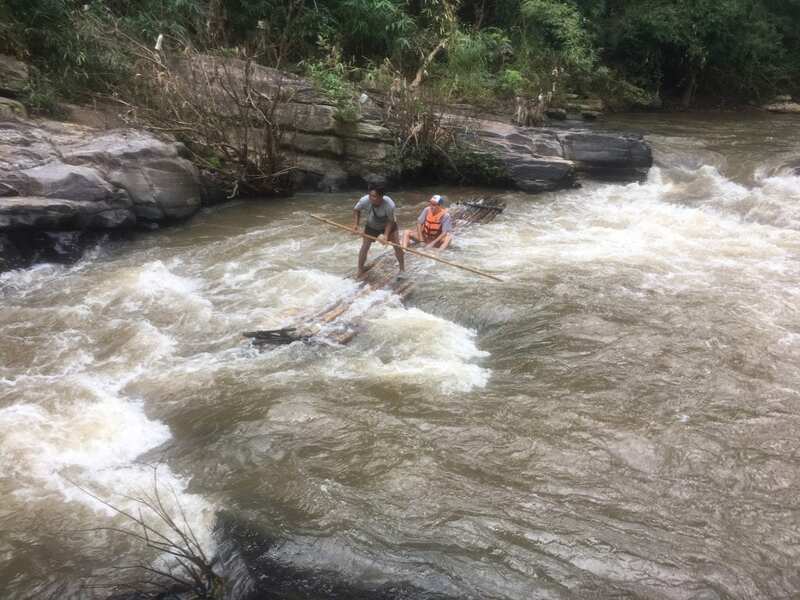 As I watched them playing – and being washed by my companions – Num appeared from nowhere with the mystery of Mr Benn to declare that it was time for us to take part in our last adventure of the day – a bamboo raft ride along the slow moving Mae Wang river. Earlier this year I had white-water rafted in Nepal, and while the waters were nowhere near as fast here, there was a much more relaxed feeling as we drifted with the current on a bed of bamboo, our trunks semi-immersed in the cool waters. En route we passed another group of tourists bathing some elephants. I think I probably lied when I informed Bruce that my first smooth gear change was the highlight of the day. The drive back to our hotel in Mae Wang, as the sun was setting and the surrounding countryside adopted a deeper hue, was quite spectacular. Just as I was beginning to think I might not be too bad at this tuk tuk malarkey after all I tried to shift down from fourth to third as we approached a bend, and Jen almost came to a shuddering halt, as I put my foot down on the clutch. Clearly, I still have plenty to learn. I have felt many sensations in Thailand over the years, but never – until now – impending frostbite. On my first trip here in 1992, I couldn’t believe how much the body could sweat, and became badly sunburnt on the walk back from the beach in Hua Hin, so much so that I couldn’t even go out for some beers later that evening. So, when Graham, the Tuk Tuk Club’s Operations Manager, warned us that we might feel cold this evening I laughed it off. 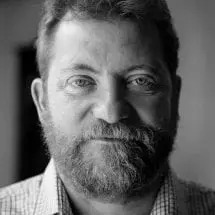 “I don’t feel the cold,” I said with the certainty of someone who has slept at the Annapurna Base Camp and gone camping in Colchester in March – the latter was the colder. 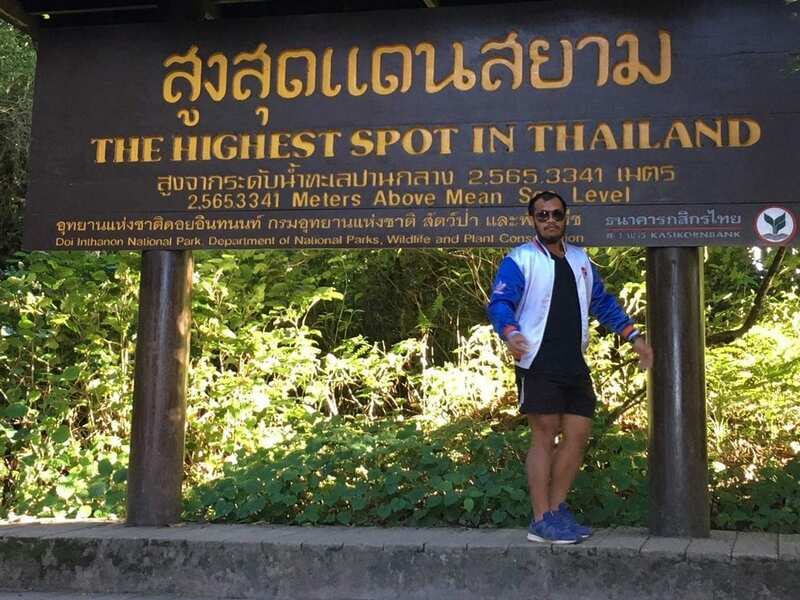 The drive down from Doi In Thannon, which at 2,565 metres above sea level is the highest point in Thailand, should have forewarned me. Sitting in the back of the tuk tuk while Graham drove, as the drive was too dangerous for inexperienced drivers, was beautiful, exhilarating and freezing cold. I regretted my decision to make the ascent in t-shirt, shorts and sandals. Earlier in the day we had left our hotel in Mae Wang and followed the same road as yesterday past the elephant home and then on to Ban Kuhn Klam where we stopped for lunch. On the way we dropped in The Maewin Coffee shop or “Coffee Rider” where we had the best coffee so far on the trip. As we were leaving, Graham was deep in conversation with one of the locals who was warning him that the road was too steep for tuk tuks. What he didn’t know was that ours had been specially adapted for these hills and are three times as powerful as a normal tuk tuk. Power that we were shortly to need. However, the man had a point. After the coffee stop I sat at the back of Jen for the first time while Bruce took over; possibly he felt that my clutch control and hill starts left room for improvement. This was much more my natural habitat as I stretched out across the back seat and soaked in the wonderful views, while watching backpackers on a day trip from Chiang Mai smiling at us from the back of their trucks – clearly envious of our mode of travel while trying to appear oblivious of our presence to preserve their cool. Locals on motorbikes or standing by the roadside were less reserved, giving us a big thumbs up and a broader smile as either they passed us or we them, respectively. I’m sure that farang ba was uttered more than once. 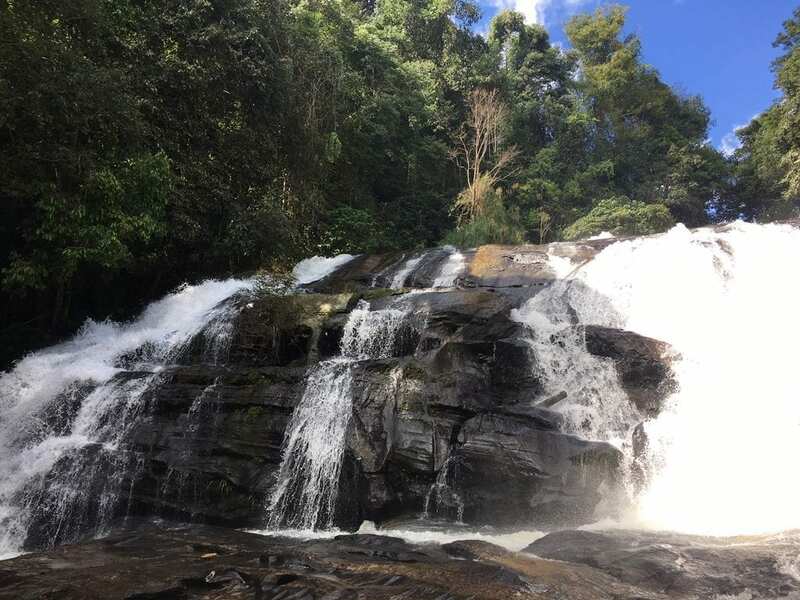 The views were spectacular with rolling fields where vegetables and strawberries were grown opening before us, as Jen climbed her way up more than a thousand metres – higher than Ben Nevis – until she took a well-earned rest at Ban Kuhn Klam, shortly after the spectacular Siriphum waterfalls. I took over the wheel for the last time in the day as we pulled into Ban Mae Klang Luang where we would stay the next two nights. A small community set in the middle of paddy fields, this is the epitome of rural Thailand. Now, as I am typing, the sun’s rays are seeping onto my wooden balcony and the only noise I can hear is the sound of birds chirping away and the flow of water, interrupted by the distant hum of the occasional vehicle. The climb from here to Doi In Thannon was perhaps the steepest of the day, with spectacular views along the way, although the summit with its observatory, small shrine and no vista was a tad disappointing. Sitting at the back of the tuk tuk the descent was cold – goose bumps appearing on my arms – and I was glad to return to my hut for a warm shower. What I had not anticipated was the manner the heat of the day would drop off so dramatically once the sun had set. At dinner I had to return to my room to put on more clothes as the family from Suffolk – Rachael, Nigel and their daughter Jess – joined Smith in a rendition of Wonderwall which woke the neighbouring dogs, who had just had a litter of puppies. Still, after a good night’s sleep – despite the cold – I awake to the rejuvenating sun and a day trekking in the Doi In Thannon national park. For today is a day of rest for Jen. Day Four might have been a day of rest for Jen and her remaining tuk tuk friend Flo – Bruce had taken J.S. named after James Stewart the journalist not the Hitchcock actor back to base with him as he returned to Bangkok – but there was no rest for us. After lunch we set off on the Pha Dok Seaw trail in Doi In Thannon national park, following the course of the Mae Klang river. An easy walk, the obligatory guide was more a much needed income generation scheme for the local Karen people than a life-saving necessity. We passed by an opening where local farmers were growing chrysanthemums rather than the opium of distant travel yarns. Following the river downstream, the sound of water crashing over rocks, we reached a small pool. Here we jettisoned out back packs and donned our bathers to have a dip in the waters that were most refreshing – think Scarborough in June. My heart started beating fast as I plunged my head beneath the surface. It was totally invigorating. Eventually, I acclimatised to the Arctic temperatures and was actually disappointed when the consensus of our group was to move on. A little further on we stopped for a picnic on some rocks, unwrapping a banana leaf to reveal fried rice and vegetables. Shortly after we resumed out trek our guide, Lung Dee (“good uncle”), stopped to point at a tree. All I could see was a mass of green leaves, but he kept on pointing. Gradually one by one all our group could make out what had drawn his attention while all I could see were leaves. A green viper had curled itself around some branches, the leaves providing the perfect camouflage. Fortunately it was taking a siesta. Apparently it had been at this spot for the past two weeks having had a particularly substantial meal which it was still digesting, hence its slumber. However, when a younger and less cautious guide tried to poke the venomous reptile with a long stick – not long enough by half – I decided that it was high time to move on. The trek continued without further surprises. 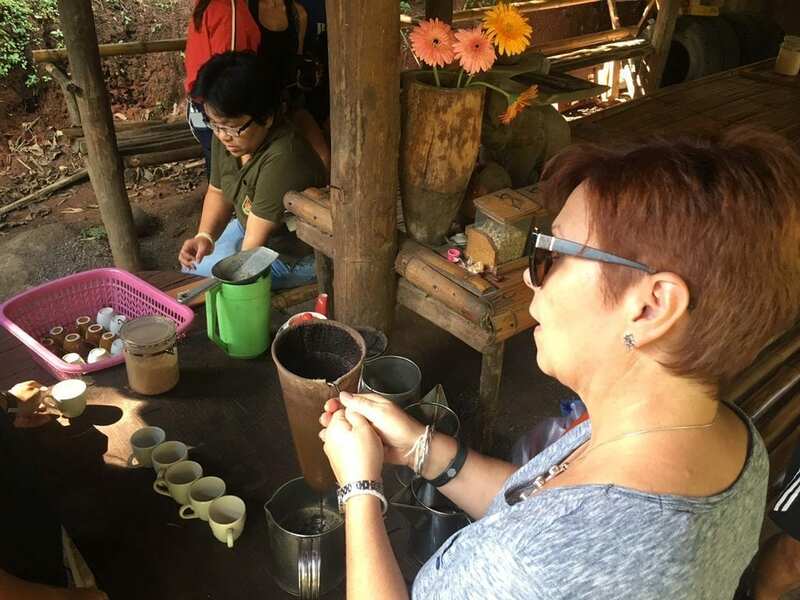 We passed a coffee plantation, where a woman was chopping bamboo to make a fence, and strawberry fields with ripening fruit, before culminating our walk at a hut where coffee was made and consumed and WiFi allowed us to post short videos of the brewing process with our friends. Nigel commented upon how you can access the internet in the remotest parts of the world yet there are still blind spots in Suffolk. That night, the moon almost full, we walked down the path to a nearby restaurant which served Thai barbecue or moo krata (literally pork in a hot pan). Fortunately, for the non-meat eaters amongst us there was also a seafood version. A pleasant end to the day, but one in which I found myself sadly missing Jen and the constant revving noise she made as she struggled her way over mountains and around hairpin bends. It felt good to get back behind the wheel again. 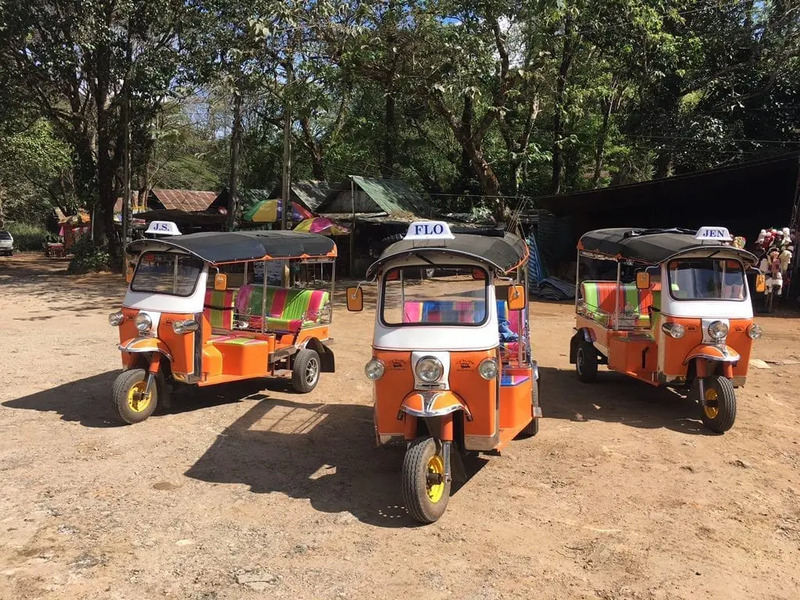 According to Graham and Smithy each tuk tuk has its own characteristics, though I will never find out as I’m a one tuk tuk kind of guy. It’s Jen or no tuk tuk for me. From here on in Smithy and I will share driving responsibilities on our 783 kilometre-road-trip. The idea is he will take the long hills and hairpin bends and I’ll drive the flatter sections. Only, as I soon find out, flat is not a word you would associate with Northern Thailand. 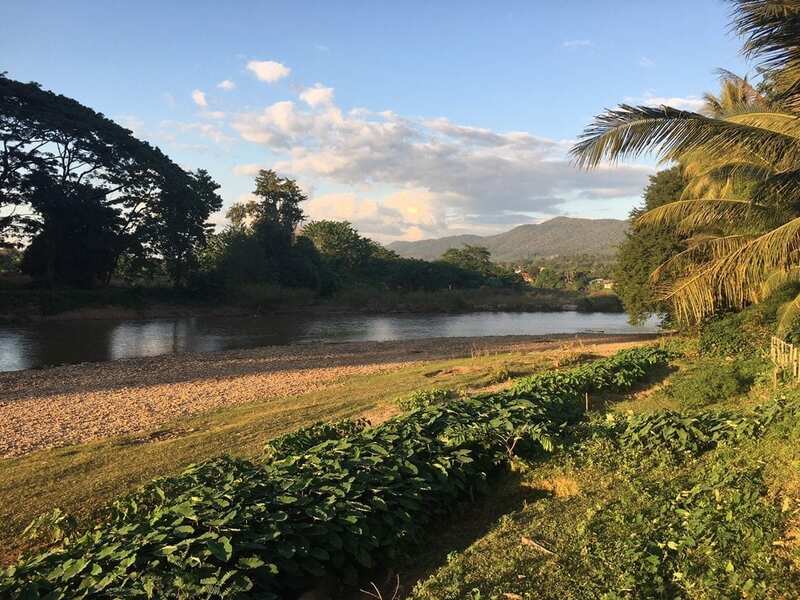 Our route today will take us downhill from Doi In Thannon – Smithy’s section – and then west towards the Myanmar border to Mae Sariang – my bit. In total today’s trip is about 160km. As Jen chugs her way down the mountain through dense forest in third and fourth gear with the clutch acting as a break, I am glad that my sole responsibility is to take the occasional photograph and admire the view. It’s only after we stop in Mae Chaem for lunch that I take over. One of the more remarkable aspects to the trip so far has been the way that Thais have warmed to the farang ba. At the restaurant where we have lunch, the staff seem more interested in our tuk tuks than they are with serving us. Seeing them taking their photographs with Jen and Flo, I offer to join them in posing for the camera. Along the route as cars and motorbikes pass us, instead of the drivers giving us the finger for delaying them on their journey, often we receive a thumbs up or a friendly hoot on the horn. This is driving with all the testosterone removed. Today is when I truly feel comfortable driving Jen – instead of dreading the emergence of the next tight bend I find myself enjoying the challenge of sliding through the gears, confident that only occasionally will my kangaroo friend make a return appearance. I have found my driving rhythm, instinctively sensing when Jen wants to change gear and when to give her a bit of welly. I even discover the art of descending a mountain in third gear without touching the breaks – although Jen does make the most frightful noise whenever I do this. After 80 kilometres or so my shoulders begin to ache and I mess up a couple of gear shifts so I realize it’s time to interrupt Smithy’s videography and ask him to take over the driving. Close to 5pm we arrive at the sleepy border town of Mae Sariang, where we head for the bars – after all this is a Saturday night. Surprisingly, we manage to find a pretty cool one. Ching Ching has an eclectic selection of furniture, including barber’s chairs for bar stools and sewing machine tops for tables. Sitting on the street drinking our beers, the neighbouring table strikes up a conversation in Thai with Smithy. Yes, we are the group of crazy foreigners driving the bright orange tuk tuks, he explains. The ones who had delayed them on their route into town. Yes, they are cool aren’t they. Who knows, perhaps we will even get our own groupies. To continue reading the Tuk Tuk Diaries, click here.